Just over a year ago, a very dear friend of mine – someone who I “met,” in this life on MySpace, but have known many lives over – shared her gift of Angel Light healing with me. She mentored me for a few weeks before actually attuning me to the modality, (a little bit different than typical Reiki and Reiki-style attunements) as I burned a white candle and spoke with her over the phone, from my California bedroom where I could literally hear the ocean through the walls. …it wasn’t long, however, before it became painfully obvious that, in spite of our jobs in the health and fitness industry, we really did NOT “fit in” here. We are earthy, free-spirited, tribal minded people who support human liberties, extended breastfeeding, no (or delayed/selective) vaccinations…we’re opposed to big government, big pharma, big corporations, “The Man,” and the likes. I am a “veganesque” vegetarian, my husband is a pescatarian, and our daughter, who WILL eat “some” meat, will let you know, however, that she very much opposes eating “dead animals.” At four years old, she is opposed, also to leather clothing and furniture. They imparted to me the almost desperate desire to know more. So, I started reading all I could about angels and different styles of angel healing and therapies. I knew that this shouldn’t be a difficult task for me, not only as an official “Angel Light” (Thanks to Isla‘s attunement) but also as someone, who as a CHILD spoke incessantly about angels and have been blessed with some amazing spiritual gifts. Most recently, after doing angel readings for myself and my daughter, I found out some very shocking, (and relevant, yet not surprising) facts about who my particular guardians are, and who hers are. After the readings, something very amazing happened in our home…my husband and I “jokingly” refer to our daughter as “Fire Starter” for her astounding abilities to manifest, almost instantly, things she wants. We also learned a while back that she is more than likely a full-on Crystal Child, and we suspected Clairvoyant and Telepathic abilities. Since we started working with our angels, her abilities have become even more obvious. We fully believe this is her spiritual gift, and we intend to foster it. I won’t say that ALL is perfect in our home right now. We are still, very much, unhappy with our current location, but are working faithfully on our spirituality, and marriage. I am pleased to say, that we have indeed, rekindled the flame that drew us together in the first place, and that we have also started counseling with Sunyata Satchitananda, an amazing healer, himself. Whenever I start to feel doubt, or concern, or apprehension…I now know, that I am not alone, no matter how alone I might feel. My angels have always been with me, and always will be. YOURS are, too. For those interested, I would be happy to help YOU connect with YOUR angels, as well. I can also offer Angel Healing sessions, either in person, or via distance. Please email me at: laylabeth@thezenmother.com for more information. 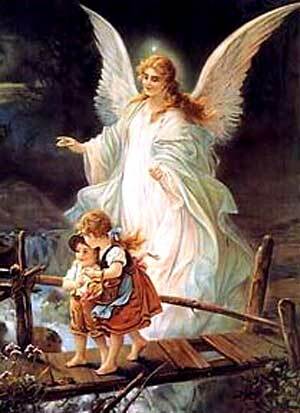 Your angels are there, waiting to connect with you. All you have to do is be open to them.